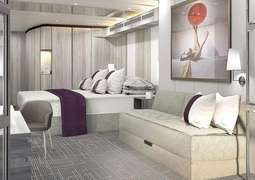 The cabins on board the Celebrity Edge offer every guest luxury and opulence alongside revolutionary new technology. The largest and most luxurious suite in the Celebrity fleet is the new Iconic Suite, positioned on the highest points of the ship allowing for stunning panoramic views and contains two bedrooms, with enough space to entertain fellows passengers. The Penthouse Suites include a living area, a private hot tub and a butler to ensure the most relaxed and indulgent experience on board. Fitted with the latest technology, this suite allows you to control every minute detail from lighting to temperature, ensuring optimum comfort. 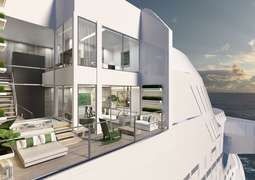 Edge Villas are another new suite category being introduced and are the first of their kind in the Celebrity fleet. These two-story cabins blend indoor and outdoor living with floor-to-ceiling windows on both floors and a terrace with a plunge pool. For every guest in the Suite Class, 'The Retreat' offers an exclusive area with a pool, bar, concierge service, restaurants with exclusive menus and a 24-hour lounge. The staterooms on the Celebrity Edge have been revolutionised to give more room and better views with their Infinite Verandas. No matter what you wish for, Celebrity Edge will meet and exceed every expectation and desire. Dining options on board the Celebrity Edge are varied and diverse. The 'Magic Carpet' offers 'Dinner on the Edge' available only on the highest deck, with stunning sights of the ocean and world around you. When it descends to Deck 5, it becomes the perfect venue for an unforgettable Al Fresco dining experience. The 'Rooftop Garden Grill' serves gourmet burgers, brisket and more to those wanting to satisfy their cravings. A blend of film and food is offered in the 'Rooftop Garden' with their 'A Taste of Film' events held in the evenings. Innovation and luxury are at the forefront in design of the Celebrity Edge, and their variety of entertainment options provide the evidence. The 'Resort Deck' is an outward-facing asymmetrical pool deck with the 'Magic Carpet', 'Rooftop Garden', 'Solarium' and more, making it the unlike any other outdoor space at sea. The 'Pool Deck' features a 25-yard lap pool with in-pool loungers, and the 'Pool Bar' offering refreshing drinks at any time of day. This area also offers private cabanas that offer breathtaking ocean views and a private space to enjoy the atmosphere. The adults-only 'Solarium' offers a covered pool area designed for adults to relax and unwind. The most exciting feature of the Celebrity Edge, and a first in the world of cruising, is the magnificent 'Magic Carpet'. Able to position itself on 4 different decks, it offers a different experience on each of those decks. From 'Dinner on the Edge' on the highest deck, an extension to the main pool area, an Al Fresco dining experience on deck 5, to the reinvigorated tender experience, the 'Magic Carpet' offers stunning experiences and breathtaking views at all levels. The 'Rooftop Garden' is perfect for those looking to relax, indulge in a refreshing cocktail or eat some delicious food. It allows for both socialisation and relaxation at all hours of the day.